Fish tacos are a fun and tasty dinner. 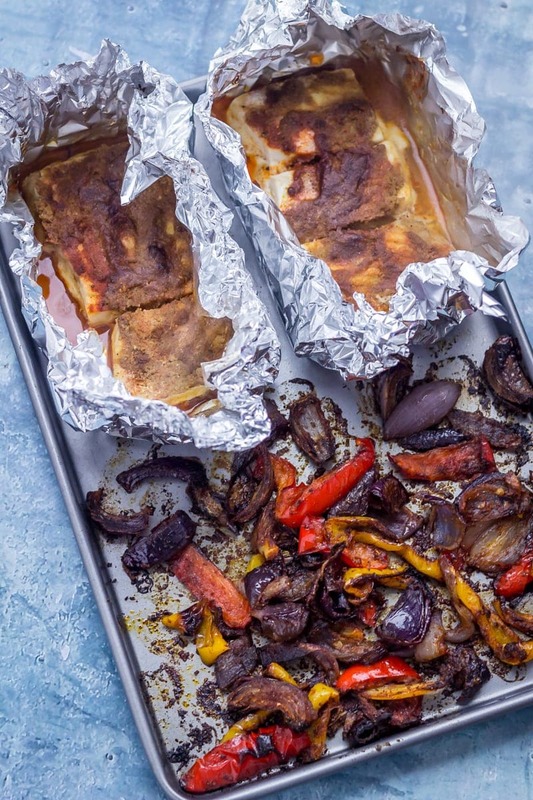 Now they’re even easier because everything can be made on one sheet pan! 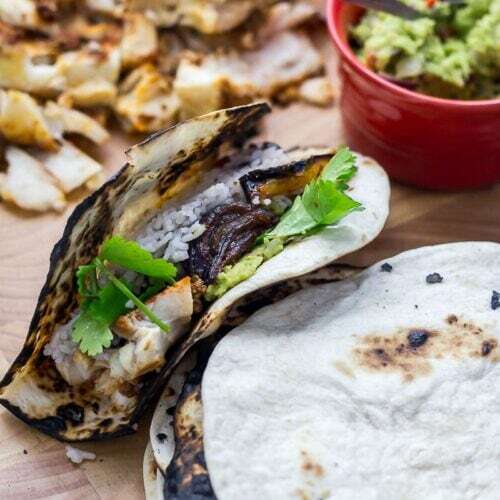 Have flavour packed fish tacos on the table in half an hour. Tacos are so much fun to make and eat. We eat them, and Mexican food in general, a lot. 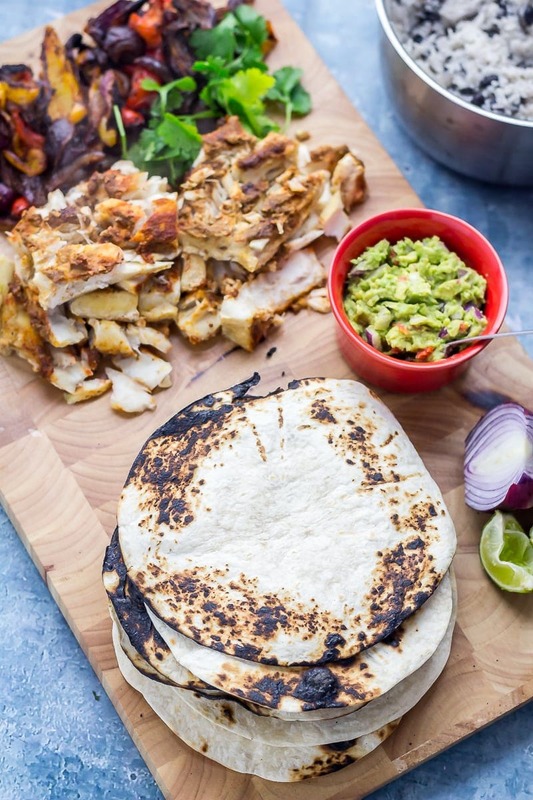 There’s some really yummy Mexican recipes already on the blog like these halloumi tacos or my favourite chipotle chilli beef enchiladas but my favourite thing about these sheet pan fish tacos is that they’re so super quick and simple. Taco Thursday! That’s a thing right? It’s the much better version of Taco Tuesday because this one is just 2 days from the weekend!! I cannot wait for the weekend. 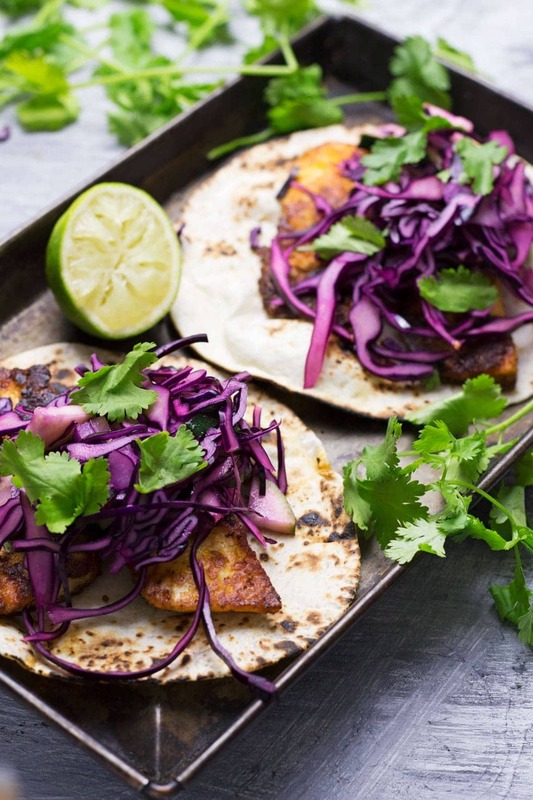 We’ve got some very relaxed plans mainly involving eating and sleeping and possibly eating some very easy Mexican food like these sheet pan fish tacos <—YES! One of my favourite things about Mexican food is how bright and light it all is. It makes me feel like summer with all that colour. These fish tacos are special because they’re all made on a sheet pan in the oven instead of in a skillet on the hob. That gives you plenty of extra time to make some cocktails and have a little dance round the kitchen. I actually used frozen fish fillets for this. You can get some really good ones for pretty cheap, they cook straight from frozen and make everything extra easy. The time I’ve put on the recipe is for fresh fish fillets but if you decide to use frozen then just cook for the time it says on the packet. 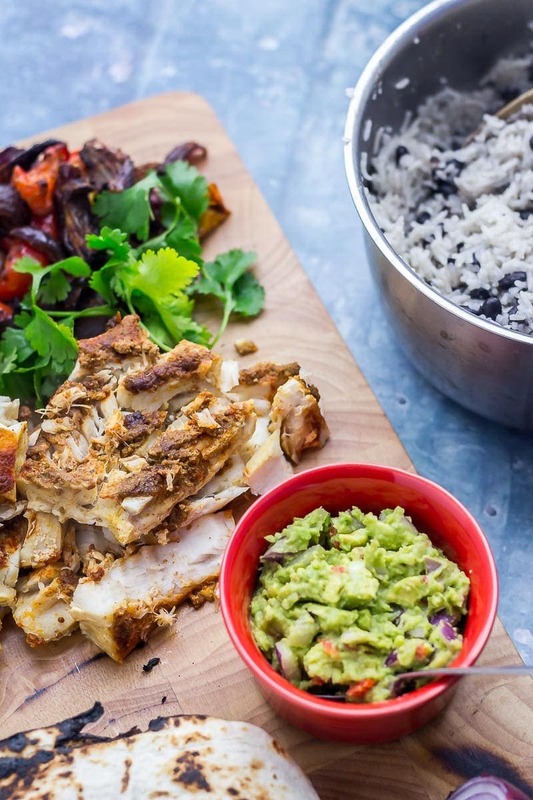 The beauty of these sheet pan fish tacos is that they’re pretty filling all by themselves but if you want something extra then they’ll go perfectly with all your classic Mexican sides. I’m thinking rice, tortilla chips, guacamole, salsa, sour cream and anything else you fancy! Although it’s not super authentic we served our tacos with rice in them because, well, I love rice and adding extra carbs where they’re not necessarily required. And we had guac there as well although I could only add the tiniest bit because I’m still just trying to work out whether I like avocado again…I know, worst food blogger ever. I use any firm white fish. Cod would be great or tilapia or even haddock. I tend to use whatever is on offer at the supermarket and consult the packaging if you want to confirm exact cooking times. Wrapping the fish fillets in foil with butter and loads of spices helps to lock in all the flavour and stop it from drying out. We like to char our tortillas on the gas hob. It takes a little extra effort but it’s so worth it for all the yummy flavour it adds. Add rice, lime wedges, coriander (cilantro) and guacamole and you’ve got the best Mexican dinner. Seriously. WONDERING WHAT TO DO WITH THE LEFTOVER INGREDIENTS YOU’VE GOT FROM MAKING THESE SHEET PAN FISH TACOS WITH PEPPERS? Fish tacos are a fun and tasty dinner. Now they're even easier because everything can be made on one sheet pan! 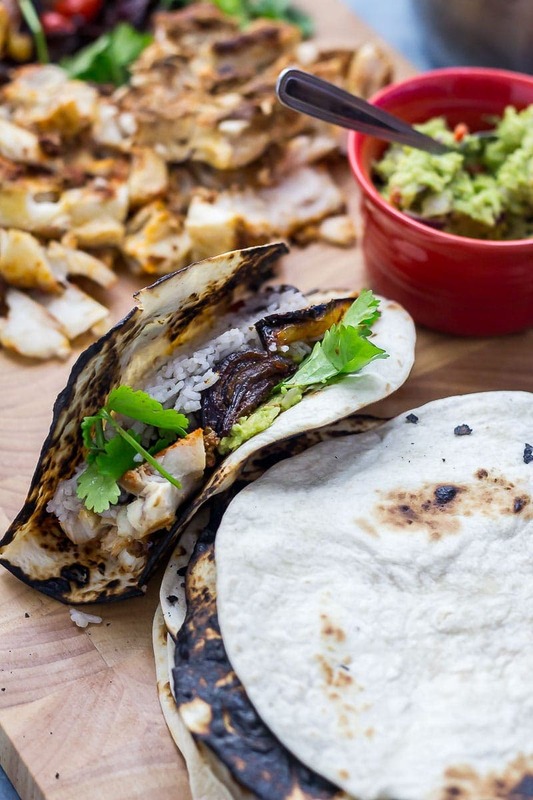 Have flavour packed fish tacos on the table in half an hour. Heat the oven to 200°C/390°F. 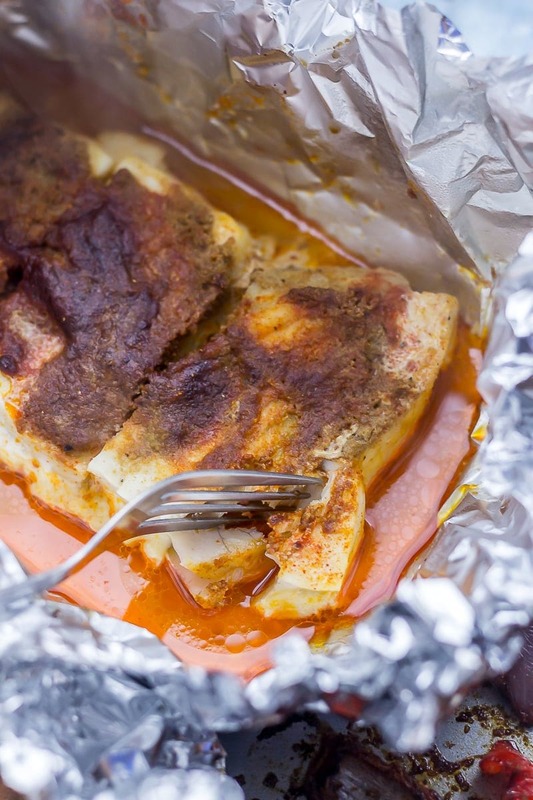 Wrap the fish fillets in aluminium foil with the butter and half the spices (you might need to do this in two parcels). Mix the veg with the olive oil and the rest of the spices and place on a large sheet pan with the fish parcels. Place in the oven for 15-20 minutes. Once the fish and vegetables have finished cooking remove the fish from the parcels and flake it. 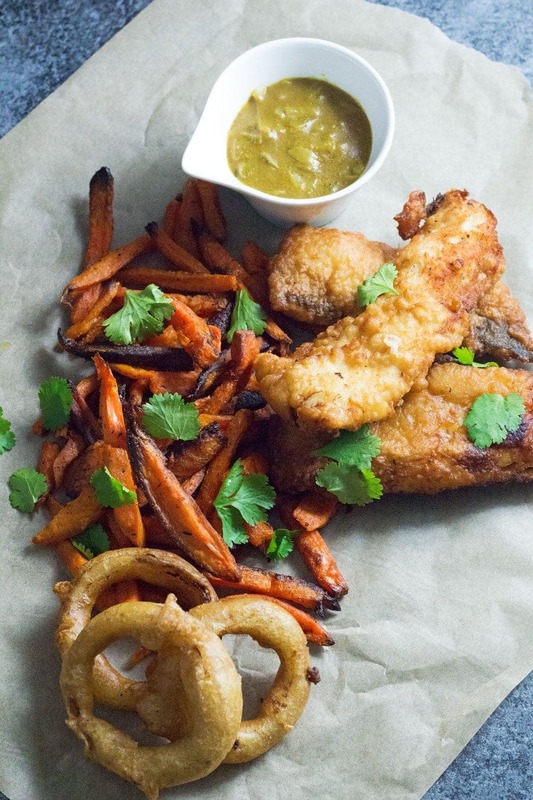 Serve the fish and vegetables with the flour tortillas, fresh coriander, lime wedges and guacamole if desired. I could eat tacos every day for the rest of forever, and these look amazing! I love fish tacos. Gotta try your recipe. 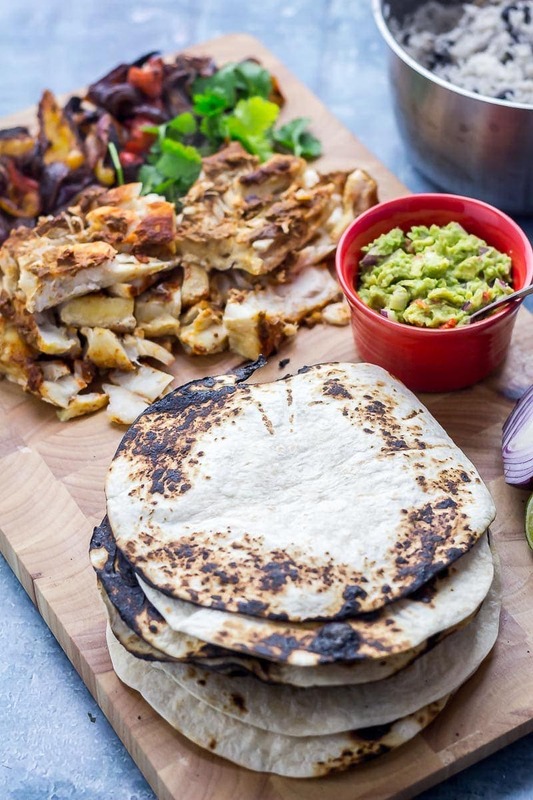 Love that char on the tortillas too! You had me at sheet pan 🙂 Srsly, I love all sheet pan meals…why did our parents not make them back in the day? Yours looks outstanding! 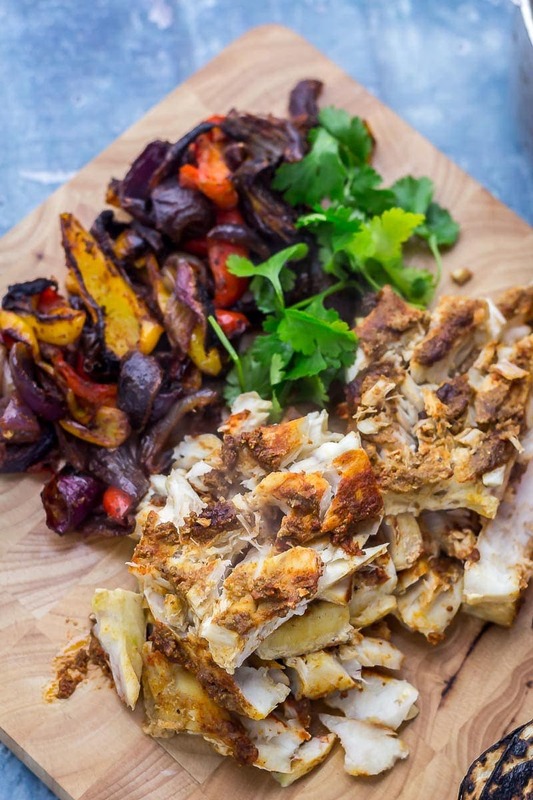 I think fish is the best sheet pan protein out there b/c it cooks so quickly. Thanks for sharing!